Entertainment Preview, August 1994. This magazine was a monthly issue for retail customers of Ingram Entertainment, a video wholesaler. 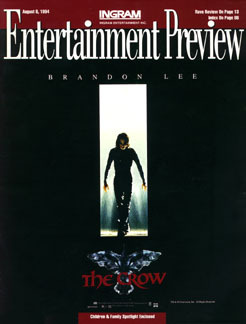 The Crow movie was featured on the cover as well as on a full-page ad inside. The wholesale price at time of release was $70.64 for VHS. The home video could be pre-ordered on August 26th and was released September 14th in both VHS and Laser Disc formats.